Washington Irving Adams, who came to Montclair in 1868, built a large residence "Irvingcroft" on Llewellyn Road, then known as Park Avenue. The historian Henry Whittemore describes this as an unpretentious country house in the prevailing style of the day. His son, Washington Irving Lincoln Adams, a writer and authority on photography, built a Georgian Revival residence (designed by architect Frank E. Wallis) at 32 Llewellyn Road in 1907 on the site of his father's mansion "Irvingcroft." 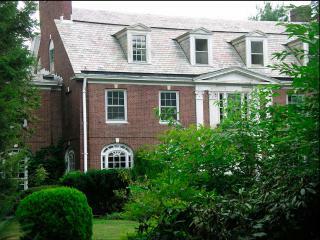 This home is listed by the New Jersey Register of Historic Places since September 29,1986.